One of the most promising movements on the horizon in Peru’s landscape is the indigenous women’s movement. Nearly 20 years ago, the Permanent Workshop of Indigenous Andean and Amazonian Organizations of Peru (TPMIAAP) was born in Chirapaq. TPMIAAP was formed to build and strengthen indigenous women’s leadership at the local, regional and national level. This was the first space that successfully achieved connection and coordination between indigenous Andean and Amazonian women, initially to follow up on the application of resolutions made in the Beijing Platform related to indigenous women in Peru. 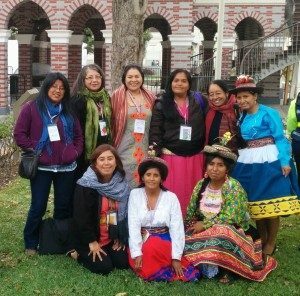 Members from the, Continental Link of Indigenous Women (ECMIA), a regional alliance whose Peru-based members are Chirapaq and ONAMIAP, at the Feminist Gathering of Latin America and Caribe (EFLAC) in Lima, Peru. The historic division between indigenous Andean and Amazonian women was likely a result of the violent internal war that caused many indigenous women from the Andean region to look for a safety refuge in the Amazons, and vice versa. This situation provoked mistrust and isolation. 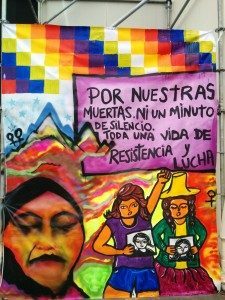 Fortunately, the momentum for indigenous women to organize in Peru for the 1995 Beijing women’s forum gave the opportunity for both indigenous Andean and Amazonian women to get to know each other, and develop a common rights-based agenda. TPMIAAP helped provide a continuous space after Beijing 95 for indigenous women to embrace cultural diversity amongst them, as well as reflect on what were the common challenges they faced and the value of uniting forces. Many outspoken indigenous leaders of Peru have emerged from this process, such as Hilaria Supa – a congresswoman who represented Cusco from 2006 to 2011. 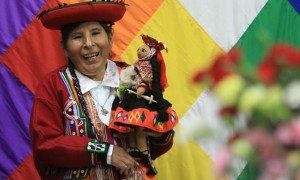 Hilaria Supa, holding an indigenous doll created by indigenous women who wanted their children to play with dolls that reflected their culture. In 1995, Hilaria Supa led a protest and lobbying against forced sterilization of women and men, done under former president Alberto Fujimori, together with health minister Alejandro Aguinaga. This racist health policy resulted in enforced sterilization of 363,000 indigenous women and over 22,000 men. Later, Supa was elected to the Peruvian Congress in 2006, taking the oath in Quechua, becoming the first parliamentarian in Peru’s history to take the oath in any indigenous language. Supa has been outspoken in her opposition to racist depictions of indigenous women on national television, including escalating it to an international level – since 2001, she’s been working on shutting down a racist television show, Paisana Jacinta, that depicts indigenous people in a derogatory portrayal. In 2008, participants of the TPMIAAP saw the need to have a political representation to channel the demands, needs and proposals of indigenous women and advocate these recommendations into national policies. It was in this moment that the National Organization of Indigenous Andean and Amazonian Women of Peru (ONAMIAP) emerged. Even though there were strong organizations that advocated for indigenous rights and leadership, the space for women’s voices and decision-making power was minimal. The work of indigenous women in climate change is essential, we defend the life of our Mother Earth. Far beyond mitigation, indigenous people that produce food for the world need more adaptation and legal protection. What’s next on ONAMIAP’s plan? Planning for the 2017 National Census, where there’s a need to include data collection of indigenous communities present in Peru. With no official numbers, it’s hard to advocate for programs and policies in favor of indigenous women and indigenous communities as a whole.